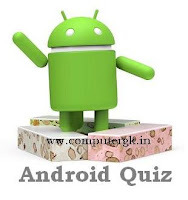 Android Objective Questions and Answers for freshers: Android Quiz becomes integral part of various test for freshers in IT Companies, Banking, IT Officers, PSU and other competitive examinations. Computer GK Sample Question Paper as part of Computer GK Sample Papers. This Sample paper will also help candidates in Competitive Exams, PSU Exam, State Govt & Central Govt. Examinations held each years. What does the .apk extension stand for? Android is licensed under which open source licensing license? What is DDMS in android? In which library MapView class is located? To use HTTPClient, which permission is required in an android application?